Welcome to Red Couch Recipes and to Lemon Week! I made this lemony dream of a pie for a family picnic held yesterday. 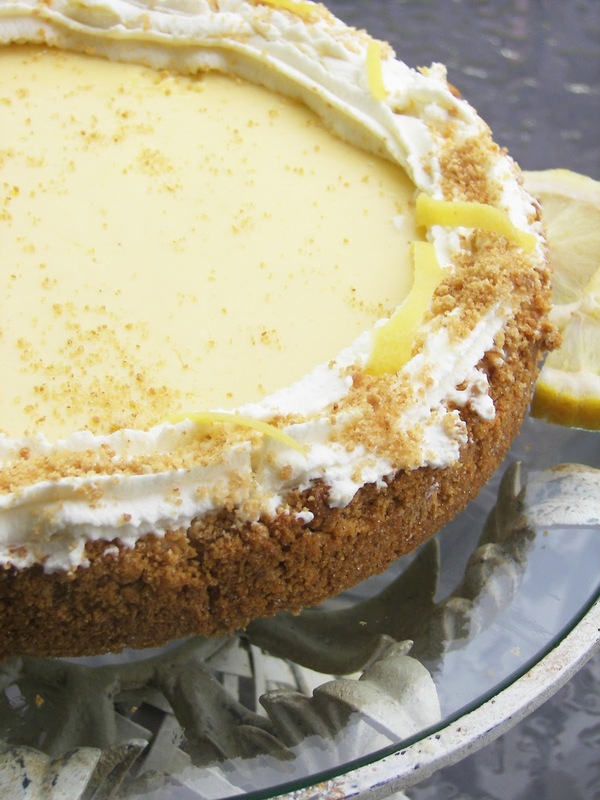 The pie was tart with lemony goodness tempered with just a bit of cream -- just my kind of dessert for a warm summer day. Just for the record, anything that contains sweetened condensed milk is just fine with me. Pie Crust -- I made a Graham Cracker Crust and used a springform pan. 2. In a small bowl soften gelatin for 5 minutes. Heat in microwave for about 14 seconds and set aside. The gelatin will help so that the pie won't sink while baking. 3. In a large bowl, combine egg yolks, and sweetened condensed milk. With an electric mixer, beat on high speed 2 -3 minutes until well combined. Beat in gelatin, whipping cream, and salt on low speed. Add lemon juice and beat on low speed for 30 seconds. Pour mixture into prepared pie crust. 4. Bake 22- 25 minutes or until center of pie looks set when gently shaken; cool on wire rack for 1 hour. Cover loosely and refrigerate at least 2 hours. 5. 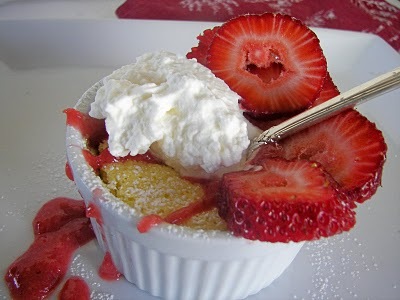 Top with whipping cream and lemon slivers. As I was removing the pie from the cakestand, I dropped the pie on the table! Not to worry, I still brought the pie to the picnic! When you have lemons, make lemonade! 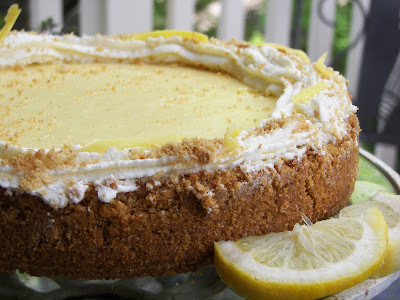 You might want to check out a few of my other lemon recipes. Just click the title or look on my sidebar and click on "Citrus" in the archives. Thanks for dropping by Red Couch Recipes for Lemon Week ;)! What a pie! My mouth is watering just looking at it. I just bought a big bag of lemons at Costco so I'm set to go. Thanks for the recipes, Joni. Have a great weekend. Lemons! Is there anything that tastes better? I just bought a bunch of lemons and I think I found the perfect recipe for them. Thanks for posting! We love anything lemony at this house - this looks scrumptious! Joni, this is such a pretty pie. I just pinned it to Oh My Pie! This looks amazing. I want to make this, but will have to wait for a dinner party or potluck or I will eat the whole thing. I love lemon. Your pie is beautiful. I wouldn't have noticed the "drop". I'd have been too busy eating it to notice. Just for the record: Anything that contains sweetened condensed milk is fine by ME too! I am absolutely, positively, making this. 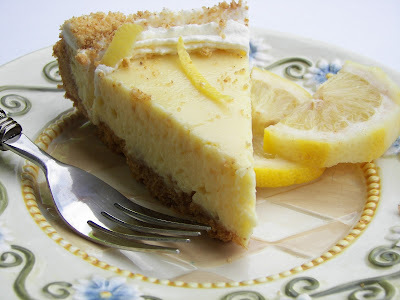 It has the lemony taste for the husband and the creamy texture for me. Win/Win. I love lemon recipes as you'll see when you stop over :) This looks positively delicious, Joni, and I'm saving a copy to try myself! Your pie is beautiful, Joni! Looks very delicious too. Have a great wknd! This one is making me weak in the knees. Is there any left! YES Please! I just adore lemon anything sweet. Looks divine! I love anything with Lemon in it! Looks delicious, and fairly simple to make. Thanks for sharing. Looks lovely and creamy. I love lemon desserts! Yummmmm...I'll have a slice please. 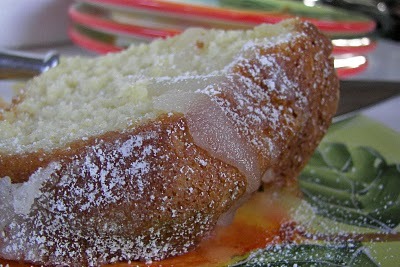 My hubby loves anything with lemon, so I'm so glad I ran into your lemon yummies!! I love all your new posts too. The lake fun it's terrific! Thank you so much for the recipes, I love this........gotta go and bake! Love. Love lemon flavor! This pie is beautiful as well as delish I'm sure. Thanks so much for sharing. I made some mini pies using your recipe and they were deeeelicious!